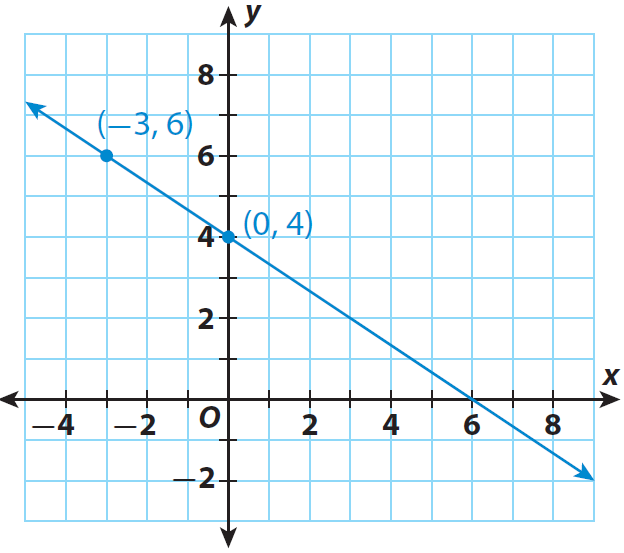 About "Investigating slope and y-intercept"
The graph of every non vertical line crosses the y-axis. The y-intercept is the y-coordinate of the point where the graph intersects the y-axis. The x-coordinate of this point is always 0. Find the slope of the line using the points (0,4) and (-3,6). The line also contains the point (6, 0). What is the slope using (0, 4) and (6, 0)? Using (-3, 6) and (6, 0). What do you notice ? It is the same as in Step 1. Find the value of y when x = 0 using the equation y = (-2/3)x + 4. Describe the point on the graph that corresponds to this solution. 4 ; (0, 4) is where the line intersects the y-axis. Compare your answer in Step 4 with the equation of the line. The number 4 is the same as the number that is added to the x-term in the equation y = (-2/3)x + 4. After having discussed the above four steps, can we find the slope and y-intercept from the equation y = (-2/3)x + 4 without any calculation ? The coefficient of x is slope and the number added to x-term is y-intercept. When can we find the slope and y-intercept of a line directly from the equation without any calculation ? we will be able to get slope and y-intercept of the line directly from the equation without any calculation. And also, the form y = mx + b is called slope intercept form equation of a straight line. After having gone through the stuff given above, we hope that the students would have understood, how to find slope and y-intercept when the equation of a straight line is given in the form y = mx + b.